How to save money with Target Baby Registry ? The baby registry is a fantastic way to save money on baby products or a complete solution for your baby planning. Isn’t it great that you receive high-quality products with a substantial discount with free shipping and no questions in case if you want to return? these are some of the benefits of baby registry but you are going to receive more if you get yourself registered. Target baby registry is one of the trusted registries which provide many great benefits to their customers that we are going to discuss in this article. Before making any registry we should collect as many details as we can. Because most of the benefits and policies are not clear until you dig out more details and eventually we end up getting something we had never expected. Review Best websites for the baby registry. Target registry has some of the best baby products including nursery furniture, clothing, diapers, bags, car seats, strollers, bath, nursing & feeding and many other items that you can think about your baby. How to Enroll in Target baby registry? The process of registration is very simple all you need to do is visit their website and create a registry account here you need provide some important details like email address, first name, last name, and password. The next step is you have to provide the expected baby arrival date. After that, you have to provide your desired registry URL which you can choose your baby name. Now enter your complete mailing address with the contact number and submit the request. Once it is submitted your account active and you will see some product listed in your profile. I consider this is the best feature added by all the registry website. Where you can add the product from any other website if it is not available with the registry. This helps you to build your registry without moving to other websites. The app makes things convenient and faster you can scan the items in the store and can manage your registry. They have more than 1800 locations which mean where ever you are in U.S it most likely that you will find store location nearby your area. You will get the welcome kit which contains $50 worth of coupon and handpicked samples. Items can vary from person to person but usually, you will find diapers, lotion, carry bags and soaps. You won’t easily find the welcome kit with all the other registries. Target registry gives 15% one-time registry completion coupon before a month from the due date via email. And you can still purchase at 15% discount if anything is left on your registry. But for that, you need to have a RED CARD. you have one year from the baby born date to return the unopened items. Simply log into your account and select make a return. All you need a registry password and government photo ID to return an item. Returning is completely free there is no shipping and other charges. The other most important benefit is that you will receive products from some of the big brands like 4moms, Britax, cloud island, Chicco, delta children, Drbrowns, ergobaby, fisher price, Graco, medela and many others. You can easily keep the track of the gifts that you are receiving from others. all are getting recorded in your account. Target baby registry provides you to have your own customized page where you can add photos, Pinterest boards and set custom URL. You can also share your registry information over facebook and twitter. They also provide the facility of order pickup where your guest can do the shopping online and later on you can make the pick from nearby your store. This is a great feature which you would find with almost all the registry. If you find an identical product at lesser price online you can claim the difference price. And your price will be adjusted under price match guarantee. If your order value is more than $35 then shipping is free and returns are also welcome with no hassle and questions. Returns are valid up to 1 year from the baby arrival date. They have most of the items are listed on their website but when you compare the availability from online to store you will find store availability is quite better than online. You also might face the issue related to registry completion coupon some of the customers complained they end up getting the coupon from the store instead to their email. 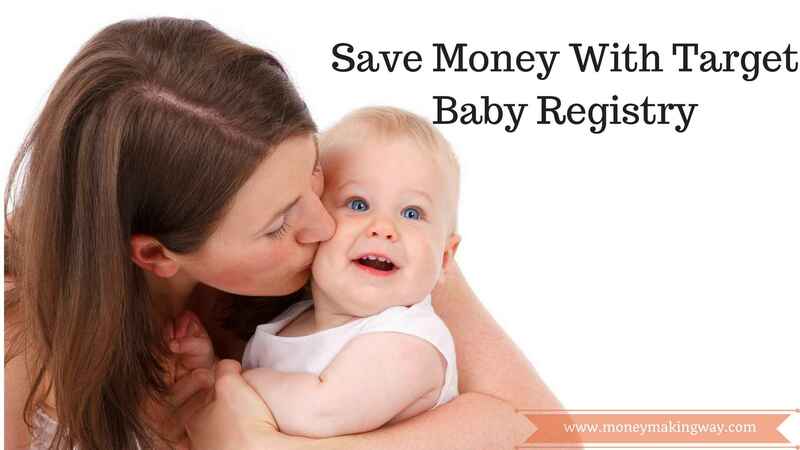 Target Registry is one of the best registries to save money on baby products which carry some of the top brands. Apart from they have some of the best features like price match guarantee, free shipping, discounts, order pickup and easy returns. They some challenges but the overall experience is not that bad. So if you are planning to have a baby don’t forget to check the target baby registry.